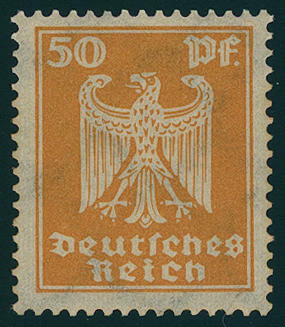 4763 344/50 Wood-pigeon 1924, all seven values fresh colors and very well perforated, in perfect condition mint never hinged, without any signs. Photo expertize \"the quality is perfect\" Hans-Dieter Schlegel BPP. Michel 1500,- €. 4764 ✉ 356XU 5 Pfg. 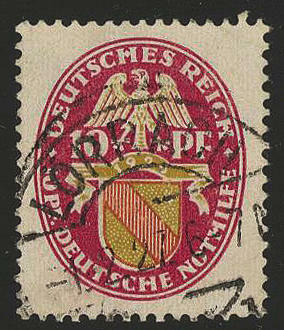 Imperial Eagle 1924 unperforated in the horizontal pair as enormously scarce correctly franked multiple franking, left stamp weak reddish spoilage line, from \"DÜSSELDORF 6.2.26. \" to Ludwigslust / Mecklenburg. Already in used condition is these variety very rare. 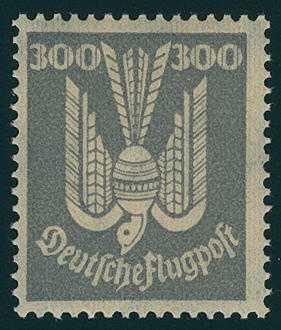 On cover and in addition to it as multiple franking a Top-rarity of the Weimar Republic also in the Michel special catalogue only noted without price! Photo expertize Hans-Dieter Schlegel BPP. 4765 360/61 40 Pfg. And 50 Pfg. Imperial Eagle 1924, the two of them top values in each case five times, fresh colors and in perfect condition mint never hinged, without any signs. Michel 1450,- €. 4766 ✉ 361 50 Pfg. 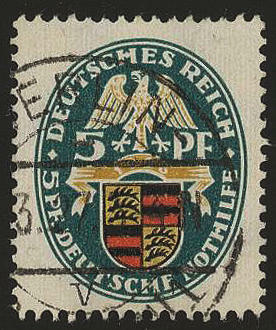 Imperial Eagle, vertical strip of three as correctly franked multiple franking on special delivery insured letter over 1001,- RM from \"REGENSBURG 31.12.28. 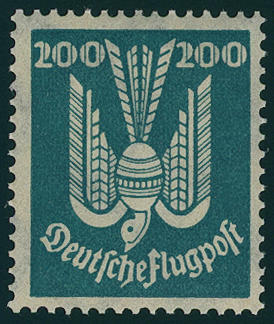 \" to Passau with arrival postmark. An all extraordinary utilization this multiple franking! 4767 ✉ 371 10 Pfg. 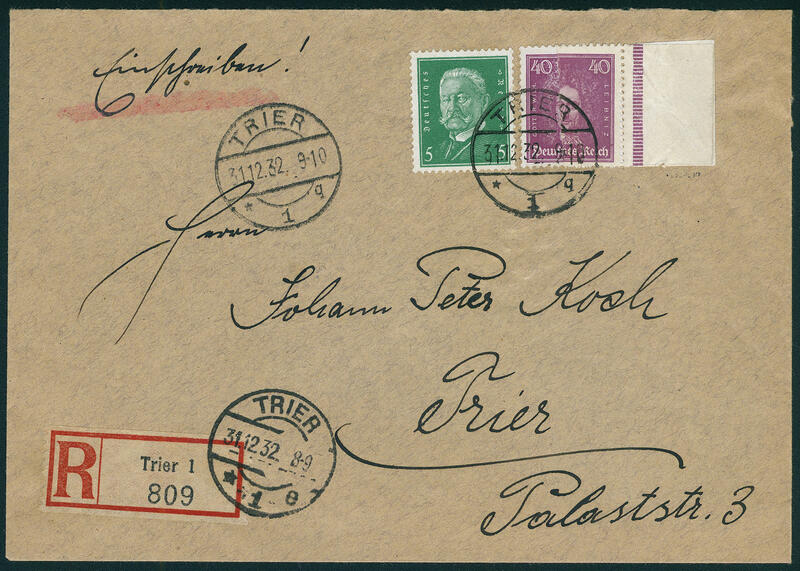 Transport exhibition 1925, block of ten as very scarce mass multiple franking on registered cover, cover two-sided opened, right little shortened, from \"DEISENHOFEN 5.9.25. \" to the United States with transit and arrival postmarks. Such frankings are from of this issue very rare! 4768 ✉ A379Pl.Nr. 15 Pfg. 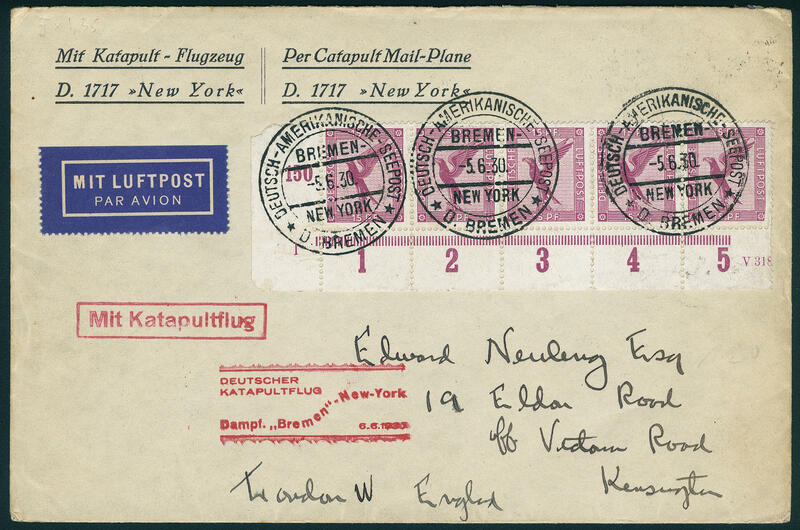 Airmail 1926, horizontal strip of five from the left lower corner of the sheet with plate number \"1\" and part the house order number as multiple franking on very nice catapult flight letter with special cancellation \"D. BREMEN German American sea mail Bremen New YORK 5.6.30. 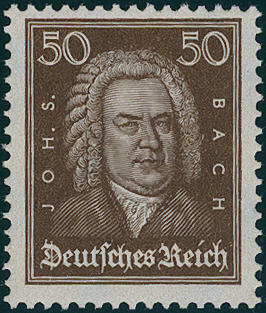 \" with red special confirmation stamp to England. Plate numbers on cover are very rare, in this kind especially decorative! 4769 ✉ A379 15 Pfg. 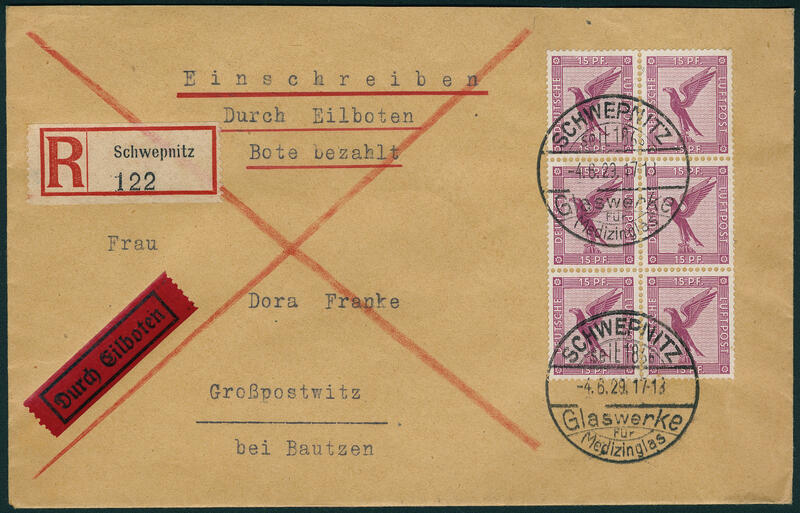 Airmail 1926, vertical block of six as very nice and correctly franked mass multiple franking on registered special delivery letter with special cancellation \"SCHWEPNITZ 4.6.29. 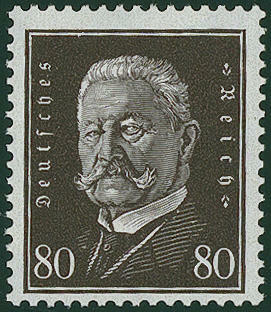 \" to Großpostwitz with arrival postmark. Very decorative! 4770 ✉ 382,384 3 Mk. 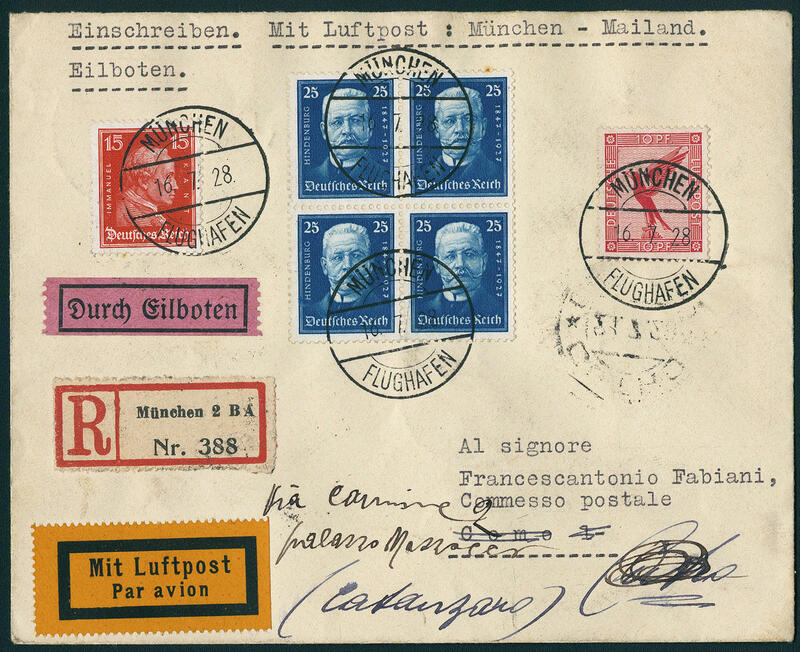 Airmail 1926, eight examples with additional franking 1 Mk. As scarce high franking over 25 Mk. 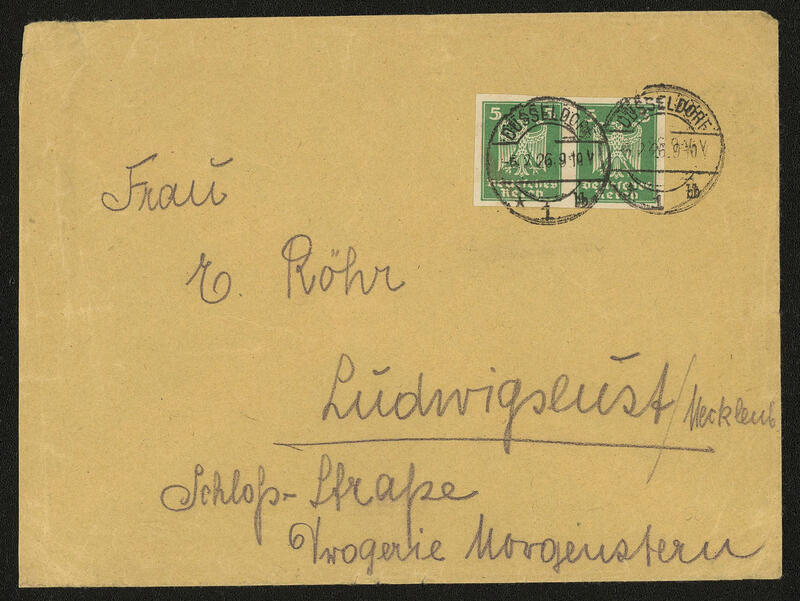 On register airmail letter, cover outside of the franking folded, small tiny spot, from \"DESSAU 14.8.27. 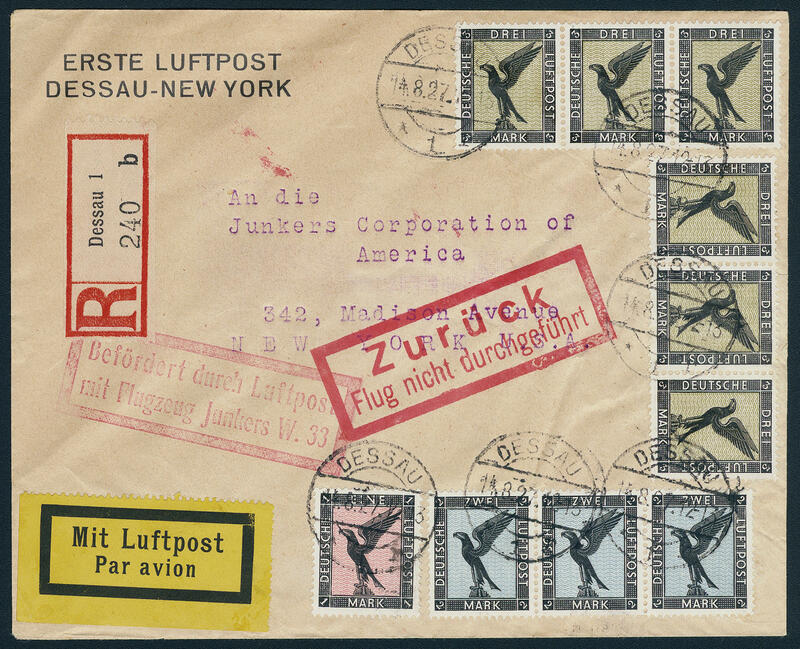 \" to New York with two red special confirmation stamp from \"transported through airmail with airplane JUNKERS W. 33\" and \"BACK TO FLIGHT not carried out\", on the back rectangle cancel \"fee becomes on application returns\". An interesting cover! 4771 ✉ 382/84 Airmail 1926, 1 Mk., 2 Mk. In the strip of three and 3 Mk. 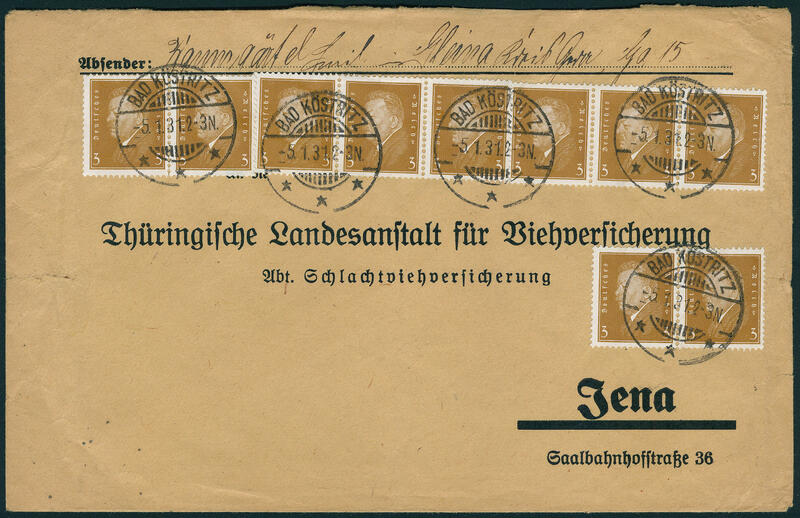 With two strip of three as particularly beautiful and high franking on registered air mail letter from \"DESSAU 14.8.27. \" to New York. A wonderful cover! 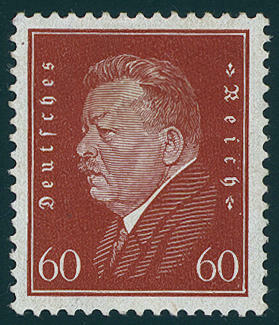 4772 385/97 Famous German 1926 / 27, all 13 values, fresh colors, very well perforated and in perfect condition mint never hinged, without any signs. For highest quality claims! Photo expertize \"the quality is perfect\" Hans-Dieter Schlegel BPP. 4773 ✉ 388 5 Pfg. 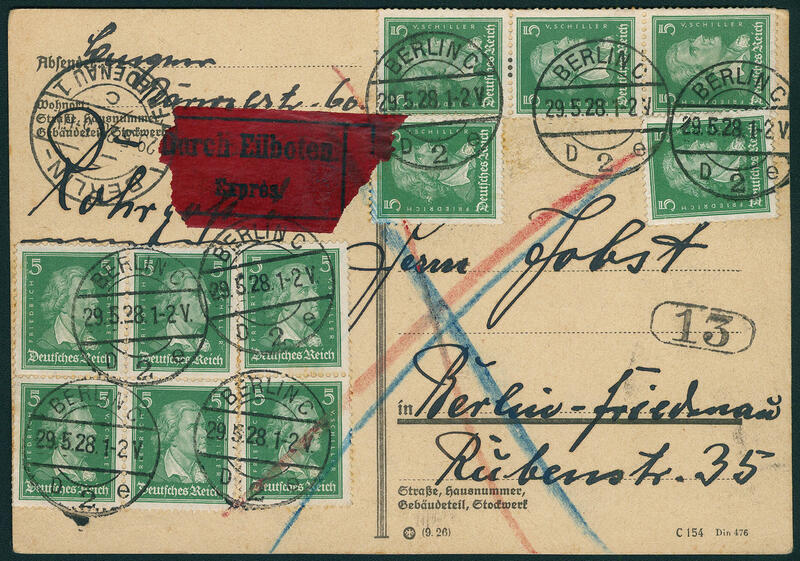 Schiller, extraordinary mass multiple franking from 11 copies on special delivery postcard from \"BERLIN 29.5.28. 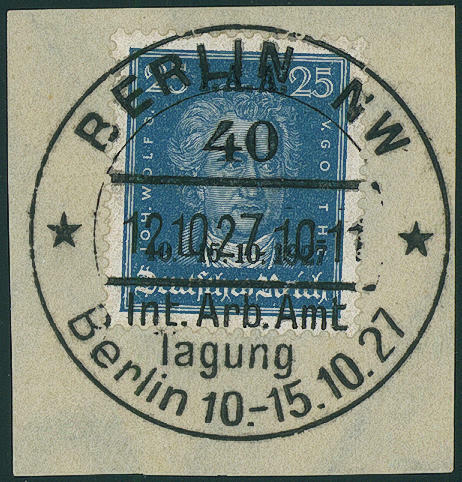 \" to Berlin-Friedenau with arrival postmark, stamps partly to the margin fixed. With this form of usage a very scarce franking! 4774 ✉ 395Pa 40 Pfg. 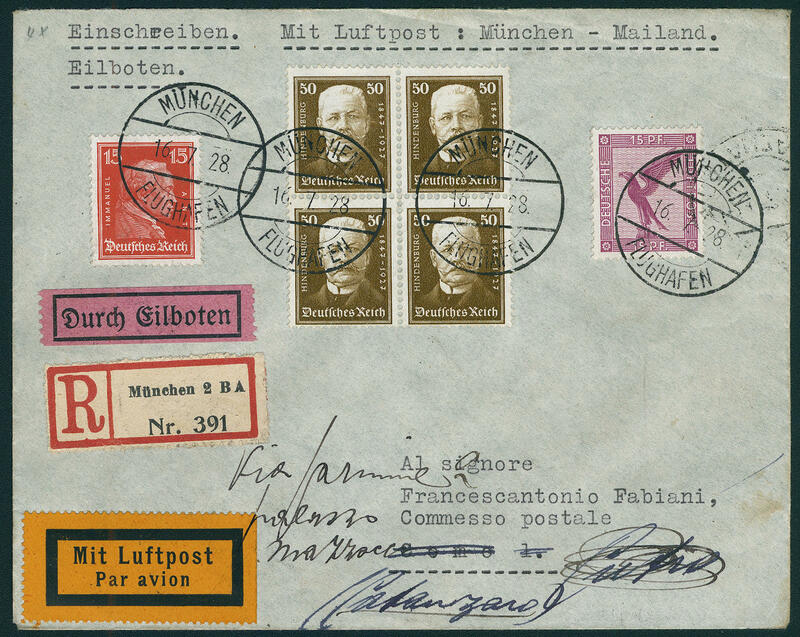 Gottfried Wilhelm Leibniz 1926 from right margin of sheet with spectacular variety \"glued paper web\", in perfect condition on very nice correctly franked registered local letter with additional franking 5 Pfg. From \"TRIER 31.12.32. 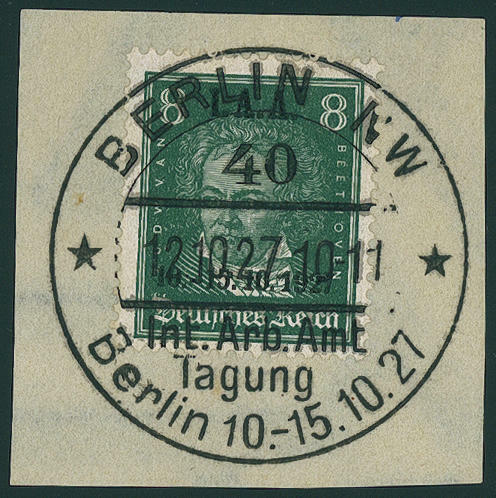 \" with arrival postmark. Glued paper webs from of the Weimar Republic are nearly unknown, because the at that time controls in the Empire printing office very stringent samples. 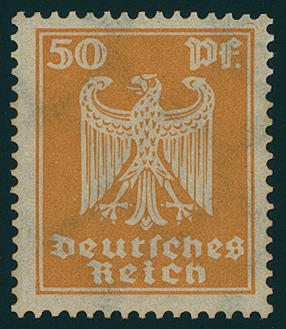 This cover counts to the all large varieties rarities of the German Reich and places a Honor for the large special collection dar! In the Michel catalogue due to missing offers only noted without price! Expertized Peschl BPP, photo expertize Dr. Oechsner BPP. 4775 ⊙ 398X 5 Pfg. 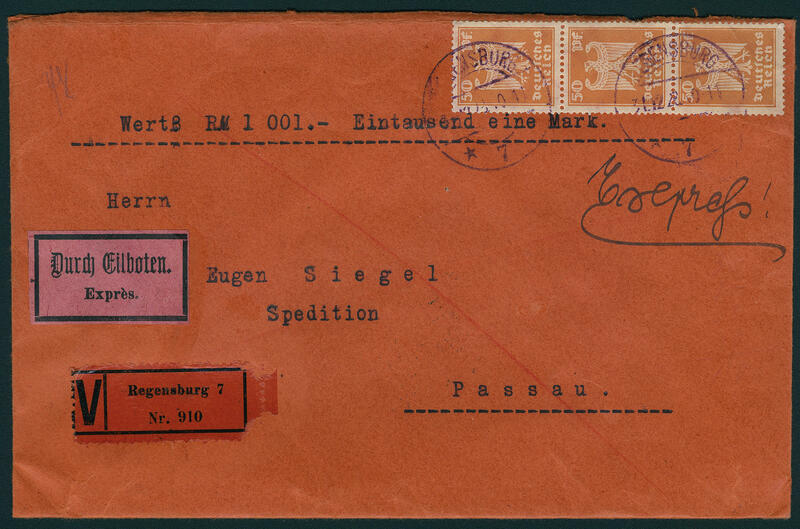 Help in need 1926, the scarce standing watermark, wonderful fresh colors and all perfect used \"BERLIN-SPANDAU\". 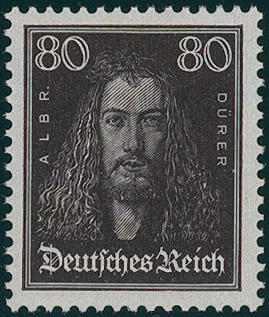 An outstanding quality this sought-after German Reich rarity! Photo expertize \"the quality is perfect\" Andrew Schlegel BPP. 4776 ⊙ 399X 10 Pfg. 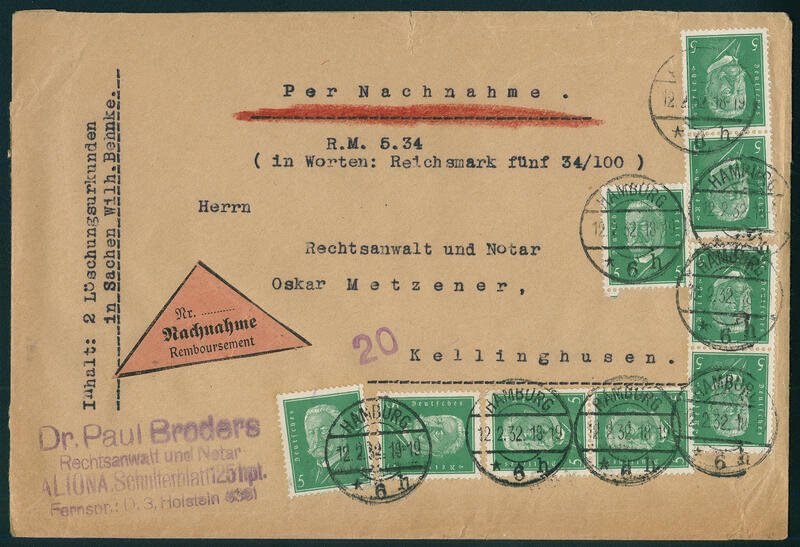 Help in need 1926 with scarce standing watermark, fresh colors and neat cancelled \"LÖRRACH 1.2.27. \", a nearly always missing issue, photo expertize \"the quality is perfect\" Hans-Dieter Schlegel BPP. 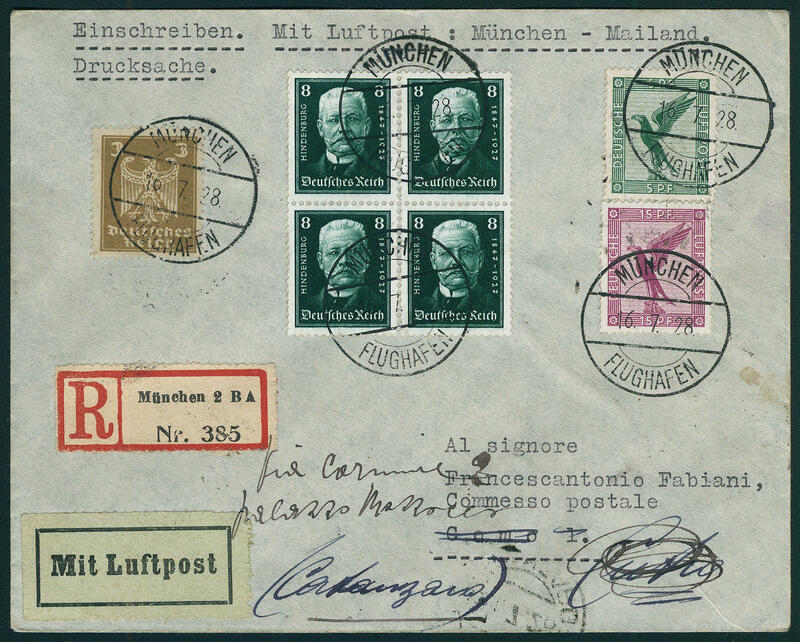 4777 ✉ 403/06 Help in need 1927, the complete set in blocks of four on four magnificently registered airmail letters, of it two by express delivery transported, from \"Munich 16.7.28\" to Como / Italy. And forwarded with numerous transit and arrival postmarks. A very decorative and scarce set! 4778 ∆ 407/09 I. A. A. 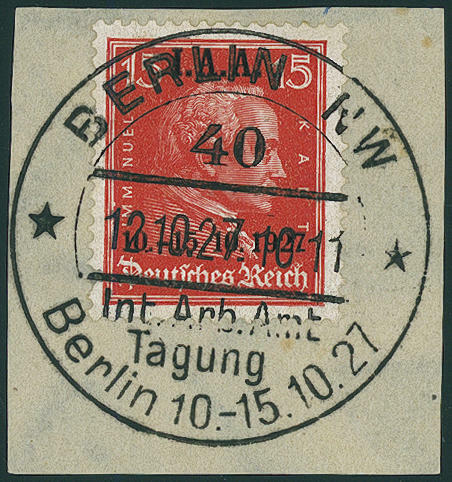 1927 on three wonderful letter pieces with perfect special cancellation \"BERLIN 12.10.27. \". A dream set for the highest standards! 4779 ✉ 410 3 Pfg. 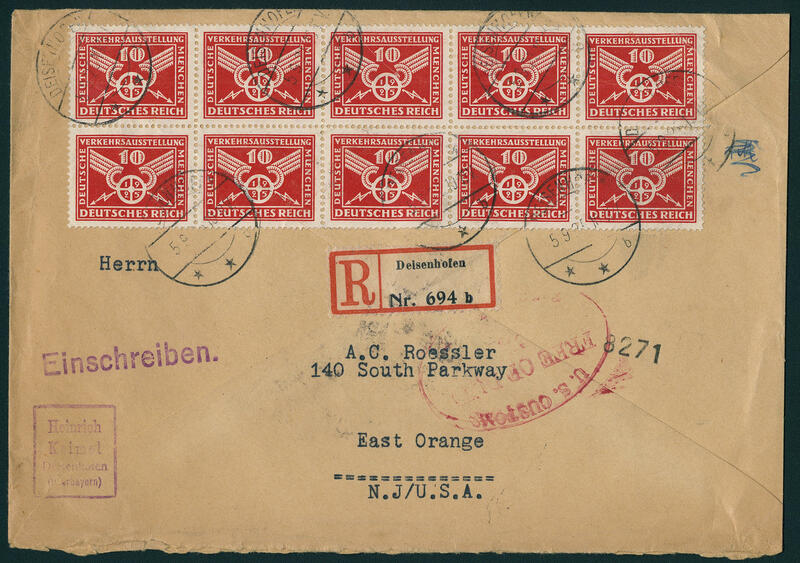 Presidents of the Reich, scarce mass multiple franking of 10 copies on commercially used cover the 2. 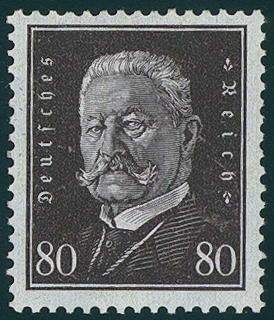 Weight step, cover two tears, from \"BAD KÖSTRITZ 5.1.31. \" to Jena. 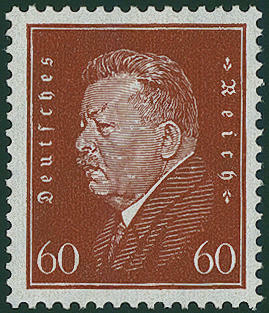 4780 410/22 Presidents of the Reich 1928, the complete set from 13 values, fresh colors and very well perforated, in perfect condition mint never hinged, without any signs, in utterly perfect condition. Photo expertize \"the condition is perfect\" Andrew Schlegel BPP. 4781 410/22 Presidents of the Reich 1928, all both fresh colors and very well perforated, in perfect condition mint never hinged, photo expertize Dr. Oechsner BPP. Michel 1100,- €. 4782 ✉ 411 5 Pfg. 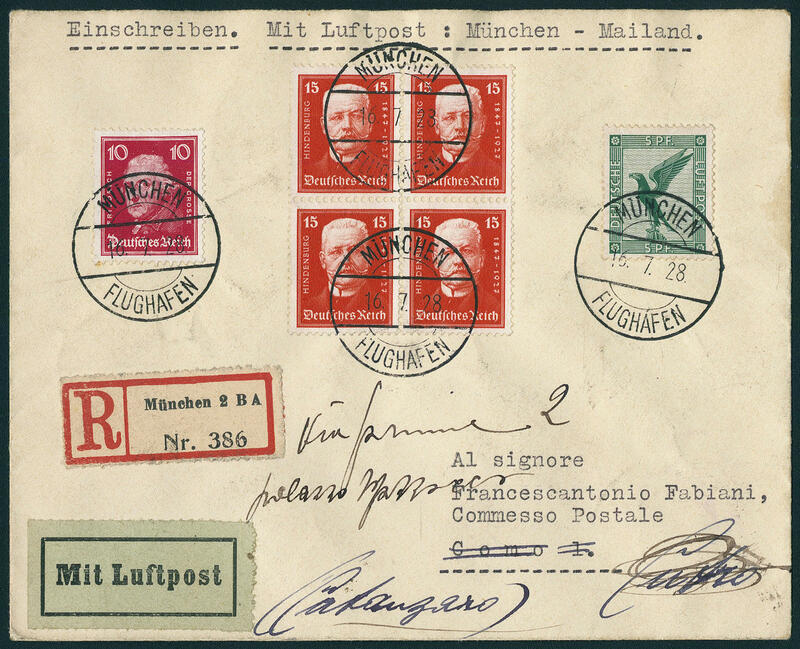 Presidents of the Reich, scarce mass multiple franking from nine copies on commercially used C. O. D. Cover, cover two tears, from \"Hamburg 12.2.32. \" to Kellinghusen. An extraordinary cover!